Congratulations on considering baptism, it is one of the most important decisions, which you can take, either for yourself or for your child. We would be delighted to help as you consider baptism and you can be assured of a welcome from the church. If you would like to arrange a baptism then please contact our Vicar, The Rev’d Tricia Fogden on 01233 758 250 or at patricia.fogden@btinternet.com for more details. Baptism is a happy and special event, usually the first ‘formal’ event in a child’s life and it provides an opportunity for all the family, relatives and friends to come together. We are pleased to be able to share it with you. We hope that your baby’s baptism will be a wonderful and memorable occasion and that it will mark the beginning of a long and happy association with St. Mary the Virgin. This information will help you with some of the questions, which surround baptism or Christening (Christian-making), as some prefer to call it. We do not put pressure upon parents or make them feel guilty about coming to church, but sometimes a baptism can be an opportunity to affirm our trust in God and to make a fresh start. We hope that the welcome you receive will encourage you to feel a part of our church. We understand the effort involved for parents with young children to get organised and make a habit of going to church but parents who do are usually pleased that they took the trouble. We prefer Baptisms to take place in the main Sunday Morning Service at church, because part of the service is the welcoming of the child by the congregation. 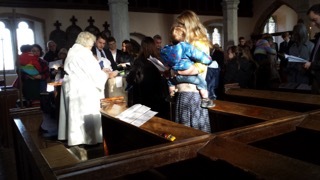 Usually the baptism occurs in the Family Service, which is held on the third Sunday of the each month at 10.30am alternating between Stone and Appledore churches. In certain circumstances it may be possible to arrange a service at another time in the month. Will you baptise/Christen our baby? This is a question which we are often asked and the answer is YES! We have never refused a request for baptism. We look forward to welcoming you and your family to celebrate this important occasion. With you we will thank God for the birth of your baby, name your child with its Christian name and welcome a new member into the Christian family of the Church. Of course if you are an adult who was not baptised as a child then we hope that baptism may be something, which you would like to consider for yourself. You will not be placed in any embarrassing situations and we will not make you feel guilty about coming to church. A permanent record of the baptism with family details is recorded in the official registers of the church.